Sharon Lambert joined the school of Applied Psychology in 2015 following a number of years working with marginalised groups in the community. Sharon’s research interests revolve around the link between mental health and addiction and how services can be designed and delivered to reach those who struggle to use services by applying a trauma informed, person-centred approach. There was a time in the not so recent past that mental health issues carried a great stigma in Ireland. When a person died by suicide there was huge sense of shame for families. Thankfully there has been a shift in this thinking, although there is still some way to go. Millions of people walk from ‘Darkness into Light’ to raise awareness about suicide. Both services and policies have a compassionate approach toward people struggling with mental health difficulties and for those left behind following suicide. However, the same cannot be said for people who use drugs and alcohol. The Health Research Board (2017) reported that during 2015, there were almost two drug related deaths per day, that is 695 individuals – the fourth highest in Europe. In the same time period 425 people died by suicide, 196 died in Road Traffic Accidents and influenza killed 27. 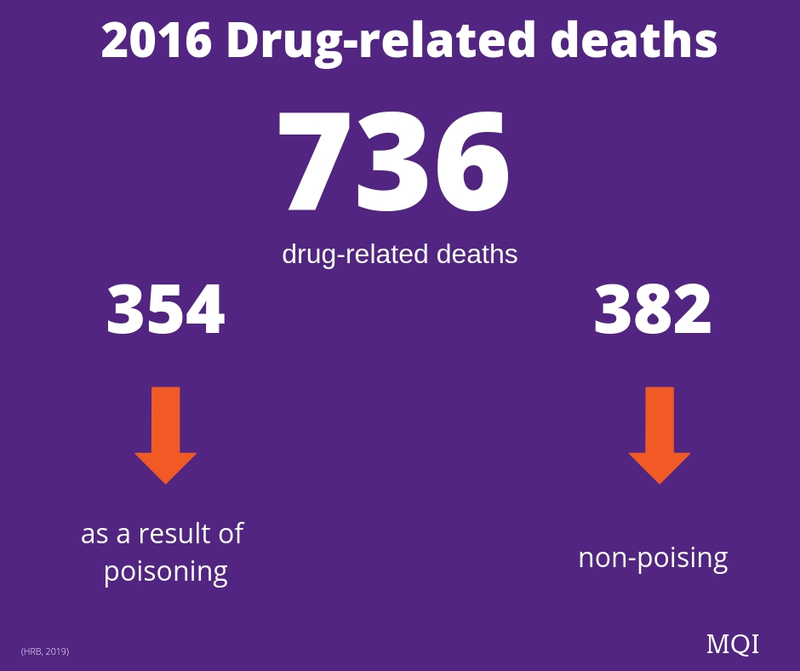 Yet the issue of drug-related deaths has gained relatively little attention. There is significant investment in suicide prevention, in road safety and in public awareness around the flu vaccination but there appears to be little consideration given to the high numbers who die from drugs every year. Why is this? There is a tendency to blame the individual when it comes to addiction, a judgement that people are making bad choices and, as such, are responsible for their own suffering. This moralistic judgement fails to incorporate the research from developmental and neuro-psychology which tells us that often addiction is an adaptive response to medicate deep emotional pain. It could be argued that, but for the fact a person uses drugs, they may find their emotional distress so over-whelming that they may end their lives. For some people, the only way to live with emotional distress is to medicate symptoms and dull the pain. I would argue that this view of addiction is the reason why addiction should be considered to be a mental health issue in its own right. However, in Ireland, addiction and mental health services operate in parallel. Most mental health services will not work with people who are in active use and therefore the most vulnerable members of our communities are denied services. A report in 2004 by Dr Liam MacGabhann identified the issues regarding the failure to provide dual diagnosis (of both mental health and addiction) services, in particular how the whole person is not supported but is instead pushed from one service to another. People become disengaged and their risk of death increases. While there has been some grassroots community-based organisations and employment of dual diagnosis workers in addiction services, little has changed since this report. Mainstream mental health services still fail to provide an appropriate service for people who use drugs. Research conducted in the last two years in UCC demonstrates the rejection, stigma and shame that people feel when they are excluded from services and when professionals fail to see their substance dependence as a mental health issue. There is an increased interest in the concept of developmental and complex trauma. There is also no question about the link between early trauma alongside the development of mental health and addiction issues. Adverse childhood experiences or exposure to toxic levels of stress during childhood impact on the developing brain. Neuroscience shows that harmful levels of stress at critical development periods have lifelong consequences resulting in a stress response system permanently set on fight or flight. A system that is constantly experiencing a stress response is likely to require something to alleviate the symptoms. In the absence of early mental health interventions, it is not strange that a person would seek to medicate these symptoms. Dependence becomes adaptive for survival. The problem with having a permanent stress response is the impact on behaviour and how services view that behaviour. If you are prone to ‘the fight response’, where your brain wires you to be combative in order to survive, then you are labelled ‘challenging’ and services struggle to manage the anger. The service user is labelled aggressive rather than frightened and it is easy for services to decide that your behaviour is unacceptable and thus exclude you. A trauma informed service understands that this is not a behaviour it is a symptom. Equally if you fail to attend three appointments or you arrive late, then you are ‘not motivated to change’, this ignores the ‘flight and/or freeze response’. This blames the client for the fact that their stress response system has wired them to have difficulty forming relationships and attachments and needs more time and encouragement to engage. It has been well established that exposure to high doses of stress reduces dopamine levels; a chemical required for motivation. Instead of understanding the science of human behaviour, we blame people for doing exactly what they should be doing. These behaviours have developed in order to keep the client safe at times when there was high risk of harm. There is indisputable evidence of the high levels of trauma in people who experience addiction. This is developmental trauma with consequent Post Traumatic Stress Disorder symptoms. We can no longer consider addiction to be a moral failing. It is a mental health issue and should be treated as such. We have an obligation to design all of our services to meet the needs of those who need them the most, those who struggle to engage with us. We should be alarmed at the high numbers who die every year from preventable deaths and the impact this has on those left behind. If we want to do something about the ‘cycle of addiction’ then we need to address the ‘cycle of trauma’. Let’s start by asking what happened to you, instead of focusing on problematic behaviours. Let’s empower those in addiction by providing psycho-education about their experiences and allowing them to access the services they need so that they can reach a place of recovery. Let’s stop the stigma and provide a trauma informed health led response to addiction. If you would like support with your addiction and/or mental health please click here.